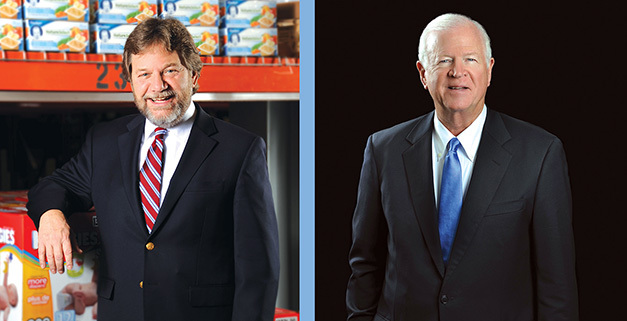 Bill Bolling and Saxby Chambliss join Georgia Trend’s Most Influential Hall of Fame. Bill Bolling doesn't say he is retiring from the Atlanta Community Food Bank, the powerhouse nonprofit he founded in 1976 and where he has served as executive director ever since. “I’m leaving the CEO position after 36 years,” he says. And if you talk to him for any length of time – say 30 seconds or more – you realize that retirement is not even a word in his vocabulary. Bolling’s ability to connect is at the heart of how the food bank interacts with its employees and more than 20,000 volunteers that serve 80,600 Georgia families every week through 600 partner agencies. He has been a connector his entire working life, connecting the movers and shakers from the business and political arena with the nonprofit and religious communities. In fact, it’s his uncanny ability to forge the connections that no else dares try that may be the biggest challenge for the next executive director. Because for Bolling, connecting is the foundation of his life. For Saxby Chambliss, the middle son of an Episcopal priest, it was never a question of if he should run for public office back in 1994. After 20 years of public service – four terms as a U.S. representative and two as a U.S. senator – Chambliss announced in 2013 that he would not seek another term, setting off a slew of changes in local politics as others angled for his Senate seat. When Chambliss won the 1994 election to represent Georgia’s 8th District, he became the first Republican to do so since the Civil War. When redistricting put his hometown of Moultrie in fellow Republican Jack Kingston’s district in 2002, he campaigned for the U.S. Senate instead. He won, helping the Republicans win the Senate majority that year and along with Gov. Sonny Perdue turned the political tide red in Georgia. A longtime champion for farmers and the military, Chambliss served on the Senate Armed Services Committee; the Senate Committee on Agriculture, Nutrition and Forestry; and the Senate Rules Committee. He also served as the vice chairman of the Senate Select Committee on Intelligence since 2011. But it’s the one-on-one interactions with his constituents that he has found most gratifying. The Georgia Trend Georgian of the Year in 2009, Chambliss is a strong advocate for improved information sharing and human intelligence-gathering capabilities. In 2011, he helmed the Gang of Six, a bipartisan group of congressmen who met informally to find a solution to the country’s national debt-ceiling crisis. “Whether you think of it in terms of the economy or national security, or any other issue that we deal with here, the fact of that debt staring us in the face immediately handicaps us,” he says. While the country’s national debt issue still looms, closer to home, the pressing concern is jobs.